Are you a university student with IT-related majors, and looking for some real hands-on development experience this summer? Then the Google Summer of Code program is just for you! Google once again is providing students with the opportunity to showcase their skills and work with Google to achieve greater heights. This time around, Google is providing students with a platform to work on Open Source projects sponsored by Google, and overseen by mentor organizations. This is nothing short of an internship, as you will gain real-world industry development experience that applies to your field, plus you will get recognition from Google, and a nice pay-check! It's all about coding! 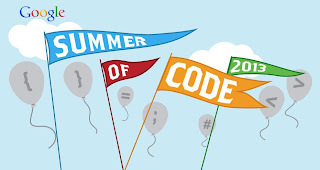 The Google Summer of Code is an annual program that has been going on for 8 years now. More than 6,000 Students have worked on projects mentored by over 400 organizations. Students will get to work on actual open source software projects over the summer. These projects will be overseen by mentor organizations, who will guide the students and address technical issues. Eligibility - There is an age restriction of 18+ for participating in this program. The students must also be enrolled in a college or university. Although preferable, students don't need to be majoring in Computer Science. It depends on the projects you are going for. And project fields also include computational biology and mining engineering etc. Big open source projects (like Linux, Mozilla etc) first choose administrators to represent their company as mentors. These mentors then submit a proposal to Google. If that proposal gets accepted, they get an account with the Google Summer of Code program 2013 (Students don't need to worry about this part). Students then submit proposals for working on specific projects with mentors. The mentors will then choose from among the applicants, and the students can begin coding once they are oriented. Students have to hand in evaluations showing their progress as requested by mentor organizations, and they will pass or fail after evaluation is done by the mentor organization. Failed students are automatically dropped out of the program. Being a university student, you should know pretty well how useful these extra-curricular activities can be. Since you'll be looking for a job soon, you will get some real hands-on experience on how things are done out there in the industry. Besides, a project such as this, especially one sponsored and recognized by Google could do wonders for your resume, and would help you out immensely with job opportunities. Besides, there's a nice payout! Approved and accepted projects will get $5,500 per student, $500 of which will go to their mentor organization. $500 are paid out after the acceptance of the proposal, and $2,250 are paid after the mid-evaluation and final-evaluation each! Real nice way to fill up your pockets this summer, if you ask me! To apply to this program, visit the Google Summer of Code 2013 website, and register as student. Registrations for organizations have already been completed. Student registration deadline is till May 3rd (12 00 PDT). So hurry! There are a limited number of slots available! Once registered, you can browse through 177 organizations to work with. Submit your proposal to the mentor of your choice (max proposal limit is 5), and wait for acceptance.